The Yotaphone 2 is currently in Singapore and being experimented on. New applications for the unique dual screen phone are being developed here in Singapore as part of Hackatron Asia (6-7 Dec). Among the throngs of developers at the Hackatron, the Yotaphone 2 was the popular challenge of choice. The original Yotaphone didn’t fare too well due to lack of apps that supported the dual screen but with renewed emphasis on developer engagement, things are looking rosier for the Yotaphone 2. The Hackatron Yotaphone challenge developers to implement apps that use the phone’s dual-screen to its fullest advantage, such as increased interaction, productivity or engagement, or for games that can use the monochrome display. Successful teams will have the opportunity to have their app pre-loaded and co-marketed together with the launch of YotaPhone in Asia. A quick look around saw a number of people developing games for the Yotaphone 2. I spotted a 2048 clone running on the back screen of the Yotaphone. It would be interesting if developers would want to use the back screen as a touch pad control similar to the Playstation Vita. I manage to get a quick look at the Yotaphone 2. It sports a 5-inch fullHD colour display and a 4.7 inch curved 960 x 540 e-ink screen on the back. Hardware is decent – Snapdragon 801, 2gb ram, Antutu scores 37979 etc. The power saving feature of the e-ink screen allows it to freeze a screen content and display it permanently without consuming battery. Useful for notification and updates and it is designed such that the Yotaphone 2 is meant to be laid with the back e-ink screen facing up. I find the phone a little bulkier than normal but not significantly so at 144 x 69.5 x 8.9mm. One issue is with regard to holding the phone. Due to the curved back, it actually feels rather comfortable to hold in the default orientation but when using the e-ink, means you are gripping it from the reverse direction and the flat angular back just doesn’t fit that well in the curve of my hand. The E-ink screen is done rather well. With pretty snappy refreshes and multi-touch responsiveness. 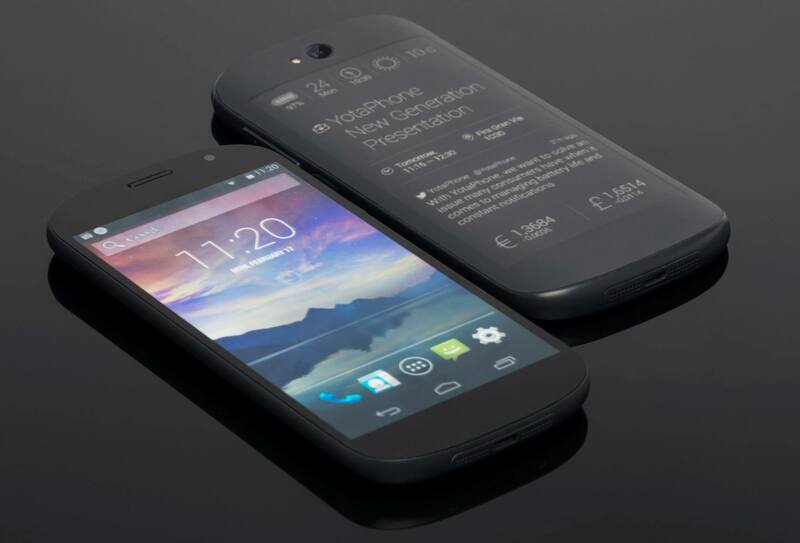 The YotaPhone 2 has added capability for full mirroring of Android software on the e-ink interface, which opens up a number of use case for the dual screen phone. Press and hold the Android home key – drag your thumb to select the YotaMirror icon, and that’s it. You are prompted to flip the phone over and you can start using the app. Readers are number 1 on the list. In addition, other possible cases could be music playlist, stock portfolio trackers, reference tables, recipes, to-do lists, calendar agenda etc. Yota hopes more developers will dive into SDK and create more apps and features that run natively on the YotaPanel platform. Would it be sufficient to attract enough developers? No news on pricing, but availability should be in Singapore soon (after the initial Europe launch). However, indicative prices based on the Europe launch is that this would be one expensive phone. 555 pounds translates to S$1100, at Galaxy Note type prices. The cool feature is definitely the dual screen, and definitely one up over the competitors with the added functionality it brings. However, competition from other manufacturers stems from partner devices such as Android Wear, which offload certain display and notifications from the primary phone. I guess one plus point is the support from Yota to the developer community and hopefully that would help break new ground in terms of functionality with the Yotaphone 2. Thanks! I’m curious, could you share more? Saw that Malaysia also sells the Yotaphone 1, or no confidence in the market here?